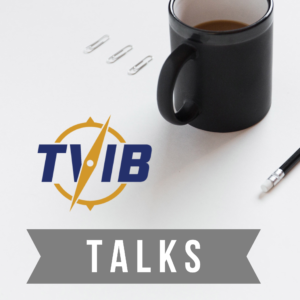 At the 2017 International WorkBoat Show, Chris Parsonage, TVIB President, presented on a panel discussing the TSMS option versus the U.S. Coast Guard Inspection option for Subchapter M compliance. Following is the first in a series of posts from that presentation. Greater flexibility for scheduling audits and surveys to fit a companies operating schedules. Companies utilizing a TPO approved TSMS will be perceived as operating at a higher level of performance by their customers. Operators subject to the TMSA requirements or the AWO RCP are already required to have an audited TSMS regardless of compliance option selected. Every Operator will eventually need a Health and Safety plan regardless of Coast Guard option or TSMS option selected. The internal survey option provides the company an alternative to conduct annual compliance surveys and five-year drydock surveys and ISEs, utilizing company personnel (or contracted surveyors), versus having to use third-party surveyors. Surveys can be conducted during normal maintenance operations. Companies can determine in their TPO approved TSMS, how they intend to comply with vessel requirements. Properly drafted Permit to Proceed procedures will be defined by the company and should allow greater ability to continue operations when minor deficiencies occur during operations. The ability to use a Corrective Action process to correct non-conformities and deficiencies under the supervision of a TPO will allow greater flexibility to schedule repairs than might be available under Coast Guard inspections. Potential for a lower fee for each annual Coast Guard COI renewal. The Coast Guard will be completing a rulemaking to align inspection and COI renewal fees to recognize the amount of work and costs related to Coast Guard inspections for towing vessels using the Coast Guard option vessels that required for the TSMS Option vessels under TPO supervision. One Coast Guard inspection in five years with the TSMS option, versus one every year with the Coast Guard option. A TSMS should create a culture of safety and continuous improvement, as opposed to a culture of compliance. The Coast Guard has given great latitude to TPOs to determine how an owner/operator can comply with Subchapter M.
Are you attending the International WorkBoat Show this week in New Orleans? Stop by and see us at booth 334. We’ll be on site from Wednesday through Friday. This week at the show we are doing a demo of an automated auditing and surveying software package that will be made available to our auditors, surveyors and TPO Customers as a secure, cloud-based software tool that can be deployed in the field on smartphones and tablets. TVIB recently passed a significant milestone when we signed our 50th TPO customer representing over 700 vessels. Approximately 15% of our TPO customers have not previously participated in a third-party audited safety management system like the RCP. 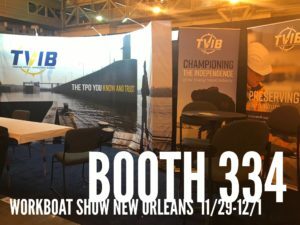 Stop by and visit with us this week at booth 334 at the WorkBoat Show in the Morial Convention Center in downtown New Orleans. Over the last two months, the Jones Act was publicly attacked in the aftermath of the three major storms of the 2017 hurricane season — Harvey, Irma, and Maria — and set a record for media attention that rivals that of the 2010 Deepwater Horizon disaster. AWO and the American Maritime Partnership (AMP) met with White House officials and key Members of Congress to provide up-to-date information about the ability of U.S.-flagged vessels to respond to each crisis. As a result, the 10-day Jones Act waiver issued by the White House for the delivery of cargoes to Puerto Rico was not renewed after its October 8 expiration. In addition, the two organizations pursued an aggressive press strategy centering on the American maritime industry’s leadership in the effort to deliver emergency cargoes to storm-ravaged communities on the mainland and in Puerto Rico. In the latter case, AWO and AMP corrected inaccurate media reports by offering on-the-ground evidence of severely damaged infrastructure and a temporary scarcity of truck drivers as the sources of the delay in transporting supplies. Jones Act opponents in and outside of Congress used the storms as an opportunity to advance their longstanding desire to repeal the 1920 law. Sen. John McCain (R-AZ), along with Sens. Mike Lee (R-UT), James Lankford (R-OK), and Jeff Flake (R-AZ), introduced S.1894 to exempt Puerto Rico from the Jones Act. Recognizing that his bill would not be taken up by the committee of jurisdiction, Sen. McCain introduced the bill using Rule XIV, a procedural motion that allows a sponsoring lawmaker to bypass committee consideration and call up the measure at any time while the Senate is in session. In the House, a number of Democrats representing districts with large Puerto Rican populations put forth a proposal to ease the criteria by which the Executive Branch may grant Jones Act waivers. Rep. Gary Palmer (R-AL), who unsuccessfully attempted to advance anti-Jones Act waivers in the past, introduced a measure to exempt Puerto Rico from the Jones Act for five years. Jones Act critics on Capitol Hill continue to look for opportunities to weaken the law, including through the disaster recovery appropriations process. Congress sent the disaster supplemental appropriations bill to the President on October 24. No Jones Act amendments to that measure were considered in the House, and Sen. McCain was prevented from calling up his bill as an amendment in the Senate due to a parliamentary procedure used by Majority Leader Mitch McConnell (R-KY). Sen. Lee, however, criticized the Jones Act during floor debate. It is expected that the Trump Administration will request an additional disaster recovery funding bill in the near future. AWO and AMP will continue a vigorous program of Administration and Congressional advocacy as well as media outreach to protect the Jones Act.